This is a two part recipe, first making a red chili salsa and then using the water that hydrated the chili peppers as the poaching liquid for the salmon. The combination is lovely. The salsa is one of my winter varieties with lots of chili to make up for lackluster tomatoes. I blend a paste of chili peppers and tomatoes, then add some finally chopped ones for texture. The salmon is cooked using my favorite methods, poached on the bottom and broiled on top for a silky fillet and crusty skin. To make the salsa, start by toasting the New Mexican and Ancho chili in a frying pan. When fragrant, add 1-2 cups of water and simmer for 10 minutes. Remove the seeds from the chili peppers and add to a blender along with a few tablespoons of the liquid, the poached tomatoes, half the onion, squeezed lime, salt, and half of the cilantro. Blend until smooth, then pour into a bowl. Add finally chopped serranos, onion, and cilantro. Refrigerate at least one hour before serving. 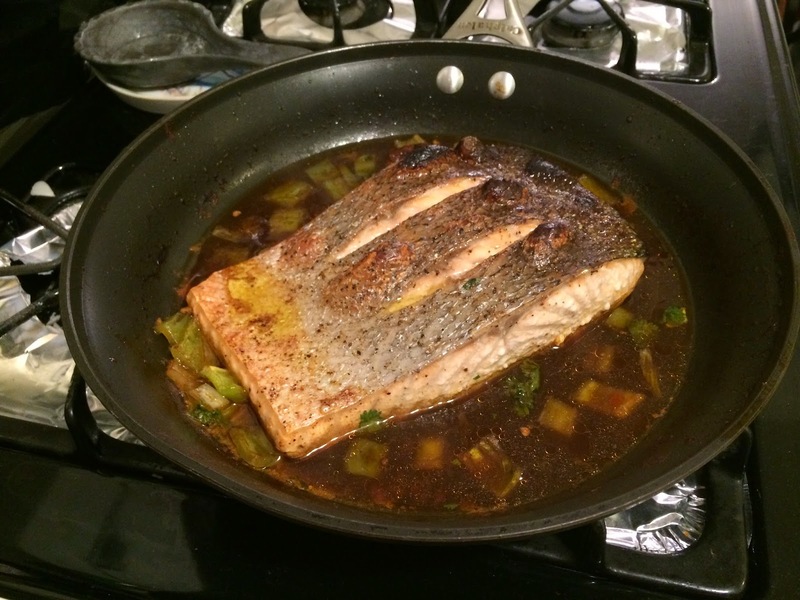 To make the salmon, remove the chili water from the pan. Fry the onion and pepper in the olive oil for a few minutes. Meanwhile, scour the skin side of the salmon with a sharp knife. Rub the skin with olive oil, salt, and pepper to taste. Add the chili water back to the pan and bring to a simmer. Add the salmon, skin side up. Place the whole pan under the broiler and cook for 10-15 minutes depending on thickness of the fillet and desired doneness. As this is my last post of 2014, please have a look at my posts on Big Data and Self Service BI Programs and on IT/Marketing (CIO/CMO) relationships. Every year on Thanksgiving and after all the guests have departed I go into my yearly ritual of making a turkey stock. Smash the bones so that it fits into a stock pot, add onion, celery, carrot, bay leaf, salt, and pepper, bring to boil and simmer for two hours. Makes a great gelatinous broth that I use to make a variety of soups. This soup is quick and easy to make. The potatoes and kale make it a hearty soup despite the lightness of the broth. You'll notice that I am not including specific quantities of ingredients because it can be made for a single person or for a family. The quantity of ingredients used should be proportional to the volume of broth. Bring broth to room temperature. In a separate stock pot, toast the cumin and chili peppers until fragrant. Add oil and onion and saute for five minutes. Add the celery, carrot, and fennel bulb and saute for five more minutes. Add kale and several tablespoons of the broth and cook for five minutes with the lid on. Add the broth, salt, pepper, and potatoes and bring to a boil. Cover and reduce heat to simmer the soup for ten minutes. Add bok choy and adjust seasoning if needed. Cook and simmer for five more minutes. Serve immediately in large bowls. Good soups require balance of flavor and texture. Ingredients need to be added in stages so that they cook properly. A variety of spices and ingredients are needed to provide richness and depth. Recently, I completed a different post on balance. In The Agile Data Organization - Balancing Responsibilities in Data Science Programs, I discuss the need to develop a balance of skills and responsibilities between data scientists, business managers, and IT personnel in developing data science programs.